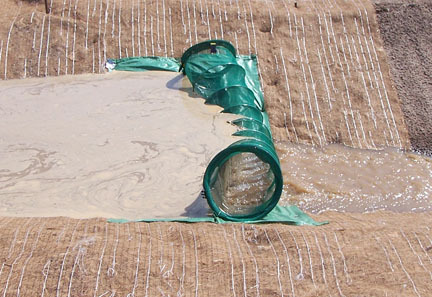 Layfield Spring Berms are used in channels and highway ditches to reduce the flow velocity of water and to reduce erosion. Spring Berms are made from a tubular fabric body with skirts extending from both upstream and downstream sides for anchoring the barrier to the ground. A helical metal spring in the body holds the body in the installed position. The product is supplied in a compressed state held together with special clips. In the compressed state the Spring Berm takes minimal shipping space. The nominal dimensions of the product when installed are 12” diameter by 6’ long, with an 18 inch skirt on each side. Multiple lengths of Spring Berm can be joined using the special clips. The fabric is designed to slow down the flow velocity of water in the channel and to trap sediment. Layfield recommends that the Spring Berm be used in conjunction with an erosion control blanket.